An evening of ballet at Sadlers Wells is always a promising treat, especially when it’s presented by Christopher Wheeldon & his own Company, Morphoses. In this first programme, four ballets with differing rhythms were introduced by Chris. This is an American touch which UK audiences don’t tend to expect; I’d prefer to hear what the choreography has to say than the choreographer. That said, it does give a clue that you are in for something different and that’s got to be applauded. As is often the case with Wheeldon, much is spoken about the people involved; nothing of the dance itself, which is a shame given that there is nothing in the programme either. 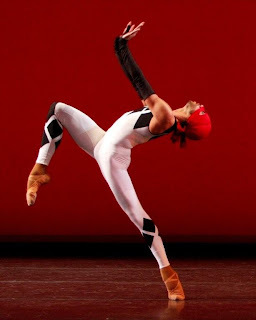 Commedia, first seen at Sadler’s Wells last year, is Wheeldon’s modern version of commedia dell’arte to Stravinsky’s gorgeously uplifting Pulcinella Suite. There are colourful masks & capes in a Harlequin style, which are quickly disposed of to reveal flattering black and while all-in-ones. As the group scattered to the corners of the wings, the use of flexed feet, swinging arms and hunched backs gradually subsided, thank goodness, showing classical lines. What was the point of the backdrop ? I only noticed it when it turned dark pink and then lifted altogether, and the lighting was used to far better effect towards the end as the group returned and faded to nothing with waving arms, Medusa style. Leanne Benjamin, on loan from The Royal Ballet, was sharper than the rest by far, partnered by her Royal Ballet colleague Edward Watson in a quirky, tender pas de deux. Leaving Songs, a UK Premiere tonight, begins with an introductory video from choreographer Tim Harbour, explaining the work, about new starts, life after death and full circles, which fades to nothing while he is still talking. The full circles seemed to be represented by balloons, but the steps were a bit on the ploddy side with uninspiring pink and blue costumes. Nothing to do with the story; nothing new I’m afraid. Softly As I Leave You begins with a dancer (Drew Jacoby) in black costume inside a tall brown box with an open front, who slowly begins banging on the sides with all parts of her body. 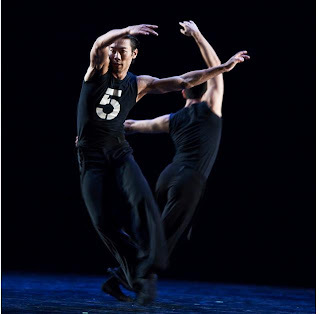 Her partner (Rubinald Prink) is powerful, moody, bare-chested, and their pas de deux choreography evoked thoughts of missing each other, either deliberately or by accident. It was dark, defiant and mysterious. Choreographed by Paul Lightfoot and Sol Leon, it’s absorbing work. Boléro, choreographed by Alexei Ratmansky (former Bolshoi Director and now choreographing at ABT), didn’t live up to expectation. The swell of the music wasn’t replicated on stage, with six dancers in cheer-leading outfits without the pom poms. It’s not an American piece but it has that feel. Wendy Whelan was superb – witty and jazzy and streets ahead of the rest. Excellent orchestral manoeuvres by Paul Murphy. Dont know much about ballet but I love reading your blog,I love the photo's. CelticWoman - you are welcome ! Thank you for this review -- makes me excited to see Morphoses when they come to NY at the end of the month! Like you, I loved "Softly As I Leave You," as did everyone I know who saw it here at the Fall For Dance Festival. Unbelievably all of the critics hated it -- all of them. There's such a huge disconnect between critics and dance-goers here. I wonder if it's the same there? Oh and by the way, I've been to countless performances here (in NY) and have never seen anyone other than Wheeldon introduce his work. I've never minded it, although, like you, I'd rather hear the work speak for itself. And if you're going to introduce the work, then do that and talk about the work, not the dancers! Anyway, thank you again for the lovely write-up. tonya - thanks for your comments. I know what you mean - the same disconnection exists over here. I loved "Softly As I Leave you" - it was different and involving where the others were not, but my esteemed colleagues appear to disagree, just as they did over the pond. I think it was a nice touch for Chris to introduce the piece - at least over here that just doesn't happen - I just wish he'd spoken more about the dance rather than standing there thanking the theatre Director for having them etc, especially given that there was nothing in the programme. Hope you enjoy the performances shortly !